When I first received this top in early November, I loved it so much I decided to style it 3 different ways! But that doesn't mean those are the only ways I've worn it. Recently I have been loving flannel tops with a cardigan on the weekends. The layers help me stay cozy with the chilly temps. When temps are up the 30s I can even forgo a coat and just wear a puffer vest for errands. The best thing about this particular top though, is the length. Unlike many of my other plaid shirts, this is a tunic length and works perfectly with a pair of fur lined leggings! Oh yes, I took a step up from fleece lined last year and haven't looked back! I got this from amazon for under $4 and they are still available here. I find they have a great amount of stretch, but completely opaque. The only downside is they can have a bit of plastic-y smell at times. But they are so warm it doesn't dissuade me from wearing them! love this casual and easy outfit. Shopping your closet is always the best way to take advantage of everything you own. 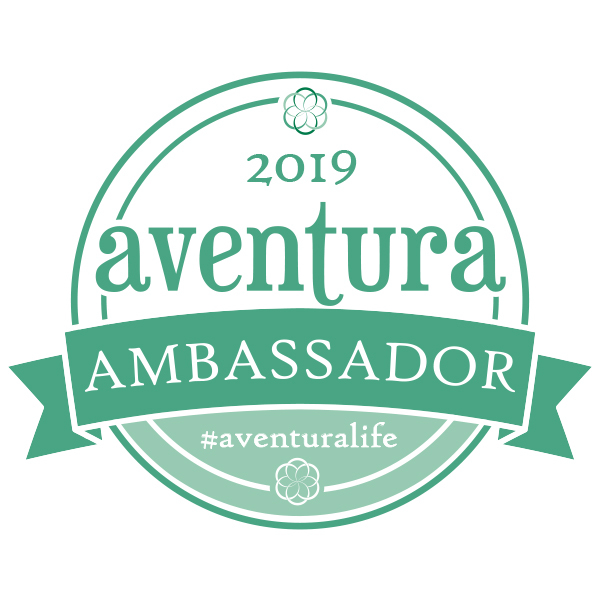 I am going to pin this! I think I have all of the components to recreate this and I love the idea of pairing light browns with the buffalo plaid! Perfect cozy look! Happy new year Laura! I love this look! I did something similar last winter and it was one of faves for the season. Happy New Year! Happy New Year! Such a cute look with the buffalo plaid! I have never thought to pair camel with this pattern...looks adorable together! Happy New Year Laura! You always look so chic! I love all your more casual outfits because they are all pieces that most people would own! I love this buffalo plaid with the tan accents! Perfect for Winter! 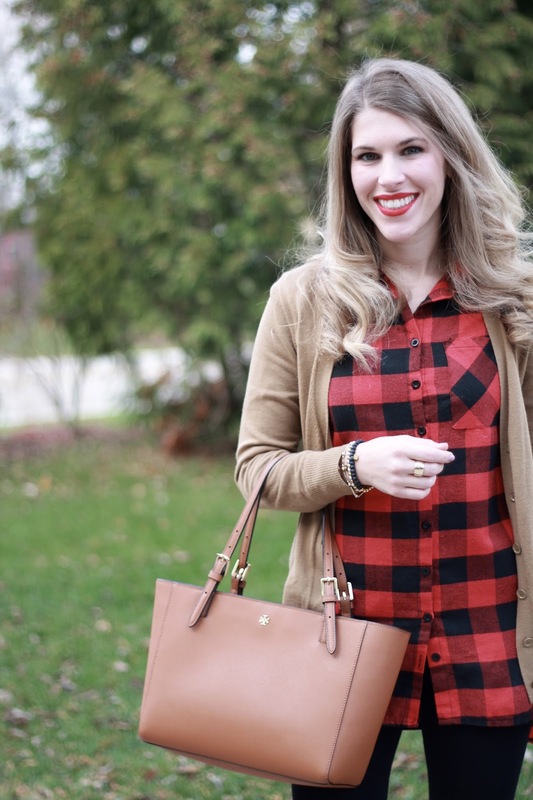 You can't go wrong with a good buffalo plaid top- love this, lady! Love the tunic length of your top! The buffalo plaid looks so good with the camel! 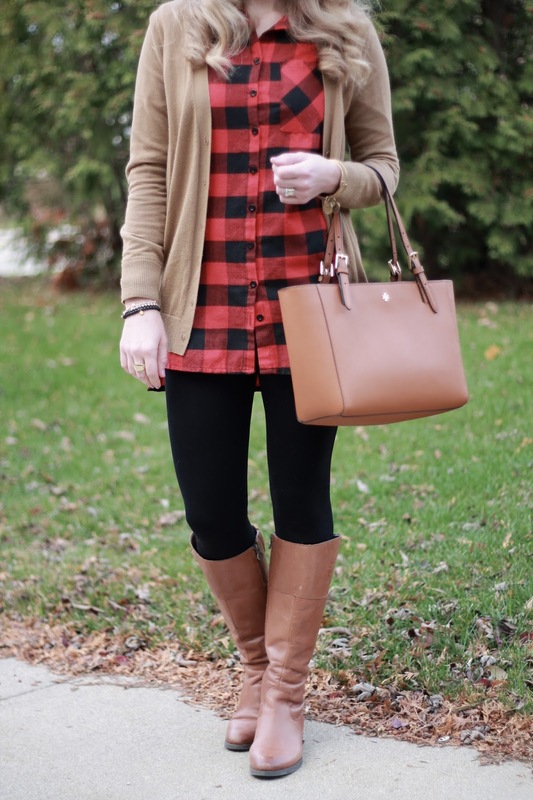 I have been needing some casual outfit inspo for my buffalo plaid top and this is perfect! And wow- $4 leggings? Great price! Love the outfit!! Such a cute top! That is such a great price for the leggings! Those leggings are such a steal!! Happy New Year! OMG...I may have to get some of those tights! I have the fleece lined version in brown, but they are starting to get worn. I was really going to try to not buy anything this month...but I almost consider this a necessity!! Fleece lined tights are always good to have around, and going with just a vest is more of a 50°+ thing for me, I'm always so cold! What an awesome look! I love the red plaid shirt with the camel sweater and boots! I love the longer length of your plaid, and fur lined leggings sound so warm! Loving this casual look! This is a great casual look. I love how warm fleece lined leggings are. Fur lined must be so cozy! Wait, FUR lined leggings?! Such a thing exits?! I need to get on this! This is such a fabulous and versatile shirt. I really like it layered with your cardigan and boots! Such a classic winter look, love the buffalo check! Prefect outfit for the winter month's. I have one pair of fur lined leggings and love them. buffalo plaid and cognac may possibly be my favourite combo that I really don't wear enough. Great looks! This looks so great with your bold red lips! Lovely top! I have a few of these buffalo check flannel shirts and they definitely get a lot of use on colder winter days! Thanks for hosting! Gotta love plaid shirts. They're so bold and makes an outfit pop. You look beautiful. I don't know if I have said if before Laura, but I love your hair - you must never have a "bad hair day" ! The plaid shirt and boots look great together. Great shirt! I love the length! It looks fabulous with the leggings & boots! 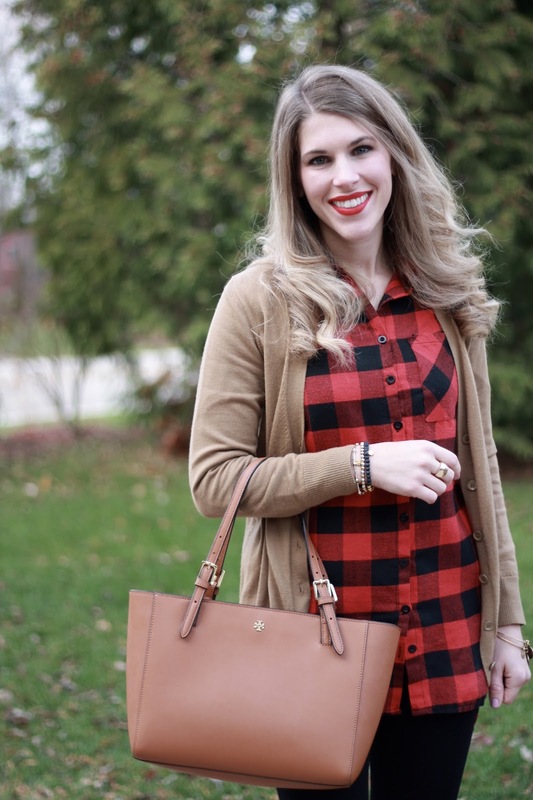 What a beautiful look with neutrals and a pop of red from the plaid! Another outfit I love and need to recreate asap!! Buffalo paid is the best! I just love seeing you stye this top! 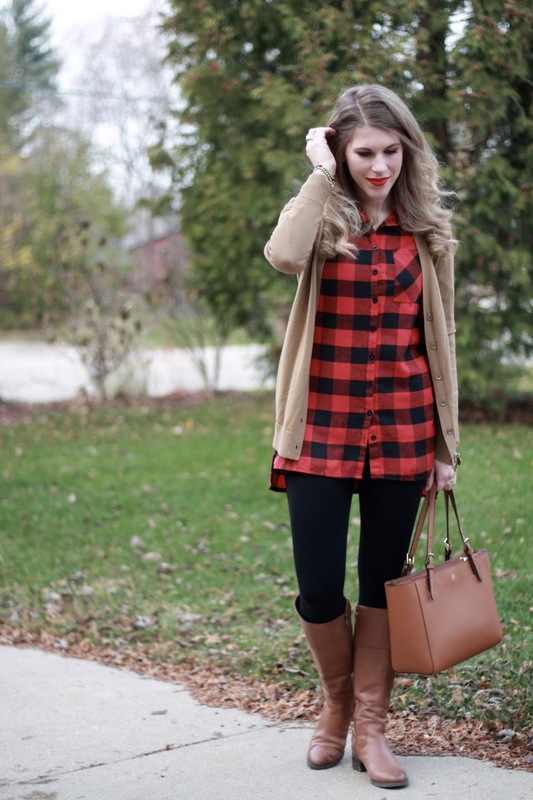 Love this buffalo plaid tunic and how you styled it with black and camel! $4 fur lined leggins? Yes please! Love this top. I've been looking for a good buffalo plaid shirt! 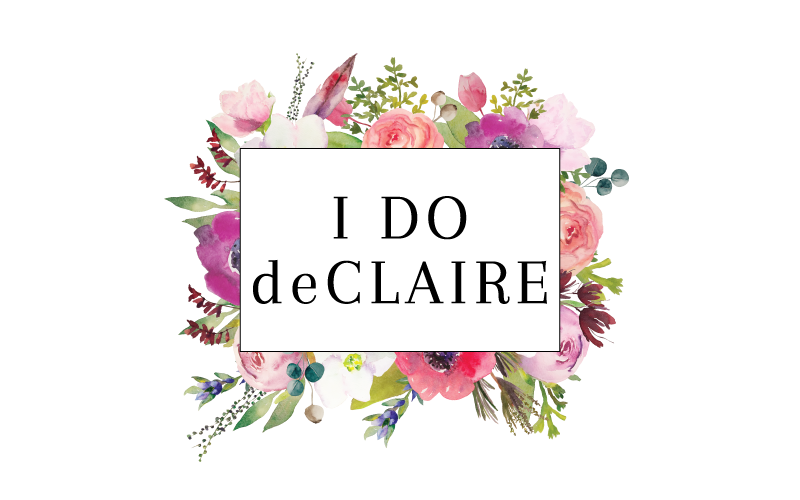 I think I have one plaid top for spring in my closet. I could use more plaid! I do have a few plaid skirts. 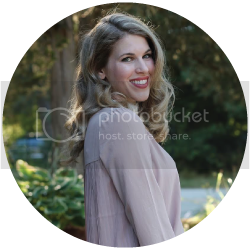 Your makeup looks great with this look too! 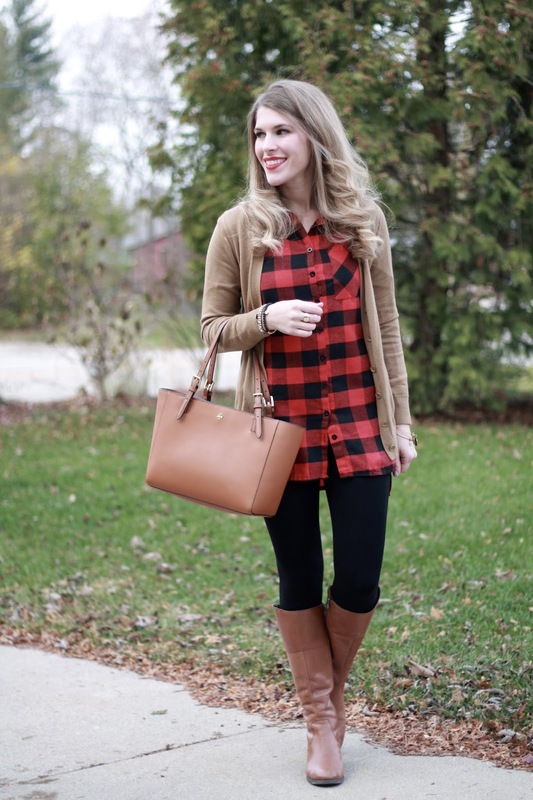 Buffalo plaid is such a great staple, and I love these boots too!